I've recently added two ruffle tops to my wardrobe and I wanted to share them here. It's a trend I love to look at but which makes me nervous as my top half is my slimmer half and I don't like to add too much bulk there if I can avoid it. 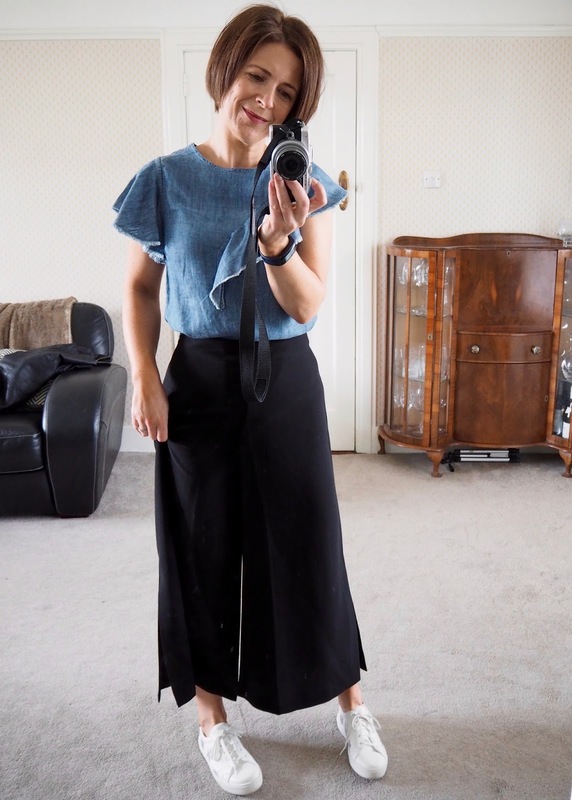 But I think I've found a couple of tops that I can channel the trend with and co-incidentally, I got both in Ballymena...where I've been spending too much time in the shops (further blog post to come). The first one is from the Next store in Fairhill and I had one of those 'grab and buy' moments with it - no thought required. 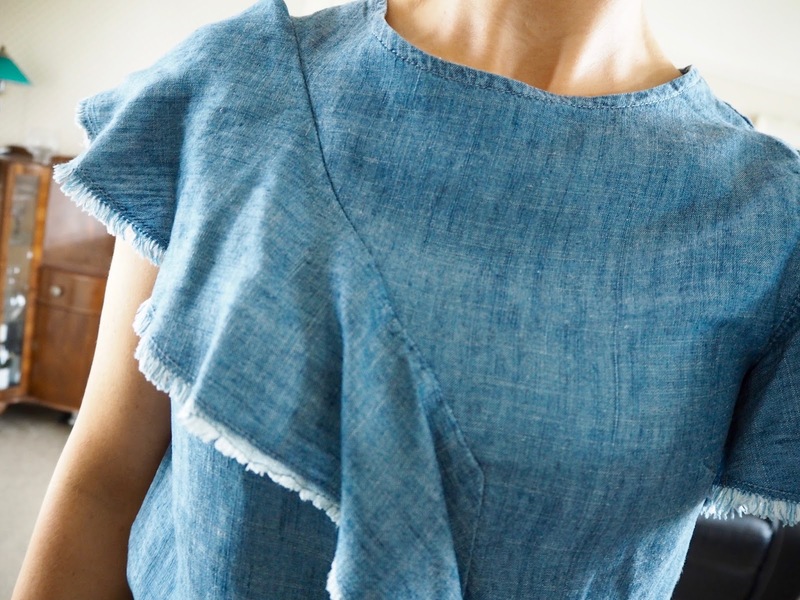 It's made from the softest chambray material and the ruffles are perfect for anyone small of bust. I sized down to the 8 as I often have to with sleeveless tops to avoid the underarm gaps. This has enough room on the waist and hips for me though in the 8 so I think it comes up big. I can't wait to wear this with white or khaki jeans. I also love how it dresses down the black culottes a bit for day to day wear, but it's still smart enough for wearing to work. Next up is this pink Sister Jane top from Primrose Boutique in Ballymena. 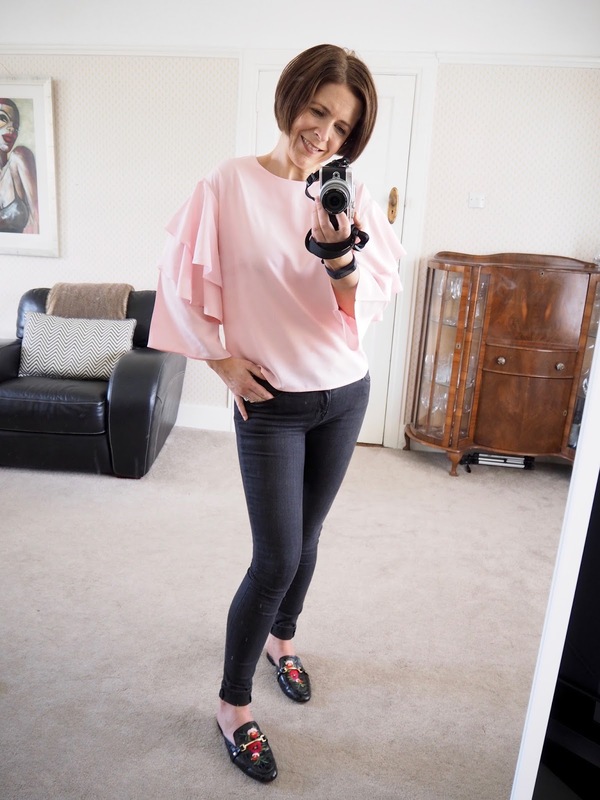 It's a smarter top with the ruffles all in the sleeves but what I loved about it is that the ruffles aren't massive, nor has it got full-length sleeves so there's no drapey material getting in the way as you wash your hands or fill the dishwasher etc. In fact, I wore it while making an entire Sunday roast last week and it didn't get in the way at all. It's a colour I don't normally buy but I was just so drawn to the detail and I love how it picks up the pink in my River Island floral mules. I also like how although it's quite dressy and wouldn't look out of place at an event, it looks good with jeans and trainers for day to day wear. After being in Primrose, I can safely say that Sister Jane is becoming one of my new favourite brands. I adore the quirky details and unique styles. Julieanne has quite a bit of the brand in her shop and also online in her website. I was so tempted by these trousers which my favourite snap-chatter Doireann Garrihy wore to the Goss.ie awards a few months ago. They're so beautifully made and the colours are stunning! I was between sizes in them though - the S was too small and the M was a bit too big. Gutted but probably not a bad thing because in true Avril style, as soon as I embraced the ruffle trend and realised I love it, I had to buy more and on my return trip to Ballymena on Saturday past (which I'll blog about in a couple of days), I picked up 2 more tops in Primrose so the trousers were not happening too! And not happy with that, I also picked up a ruffle detail shirt in Marmalade Boutique. Now none of the 3 are quite as ruffle-y as the two above so they might suit you if you still think those two are too much. I'll get pics and a blog post up as soon as I can. In other non-ruffle news, I'm off to Dublin in the morning for the official launch of work's new essential oil candle brand Field Apothecary! I've been working for Bog Standard since September and just last week we rebranded to Field Day and tomorrow, we launch our standalone luxury candle brand Field Apothecary - which I'm so excited about! I've honestly never come across fragrances like these before - they are STUNNING and it's all local and made by busy mum of 2, Alix who found me via this blog and gave me the opportunity to work with her on the rebrand and this launch for the past 6 months. I've loved every minute and I'm hoping to stay with the company for the foreseeable as we grow both brands and give them the following they deserve. Keep an eye on my stories and snapchat for live updates and I promise I'll do a candle giveaway after Easter.